It's time for more Nintendo Download Update treats, North American gamers, and this week brings the region its first cross-buy options on Nintendo's systems. We have Mario toys puzzling their way through levels and some rad pixelated skateboarding across Wii U and 3DS, while there are also discounts, updates, HOME themes and more to consider. Let's get to it. Missed the European Download Update details earlier in the week? There's no need to run around the room wailing in despair, as you can still get all the info you need right here. 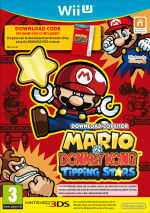 Mario vs. Donkey Kong: Tipping Stars (Nintendo, $19.99 or free if you purchase the 3DS version and redeem the code provided) - Nintendo's first full cross-buy promotion in North America, this moves away from the 3D isometric approach of its immediate predecessor and returns to the series-standard 2D perspective. You solve a whole lot of levels by using various tools, and in this title the levels you create yourself are shared online and rated by others, with you being 'tipped' stars. You can see our review (in progress) right here. OlliOlli (Curve Digital, $8.49 or free if you've already bought the 3DS version on the same Nintendo Network ID) - The popular twitch-reflex skateboarding title from Roll7 makes its way to Nintendo hardware, with a whole load of tricks, combos and grinds to master. It features tricky stages, online leaderboards and daily online challenges to take on, all with tight controls; critically acclaimed on PSN, we'll let you know how it stacks up on Wii U. You could always check out our preview while you wait. 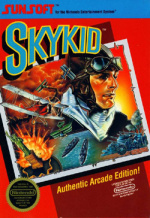 Sky Kid (Bandai Namco, $4.99) — This is a side-scrolling shooter that oozes 8-bit charm, with visuals and music typical of the early NES era. The downside for some will be that the charm may wear off rather quickly, with limited content held up by arcade-style looping levels. It's all down to whether you're a fan of these score-chasing arcade-type games, as we explained in our Sky Kid 3DS Virtual Console review. 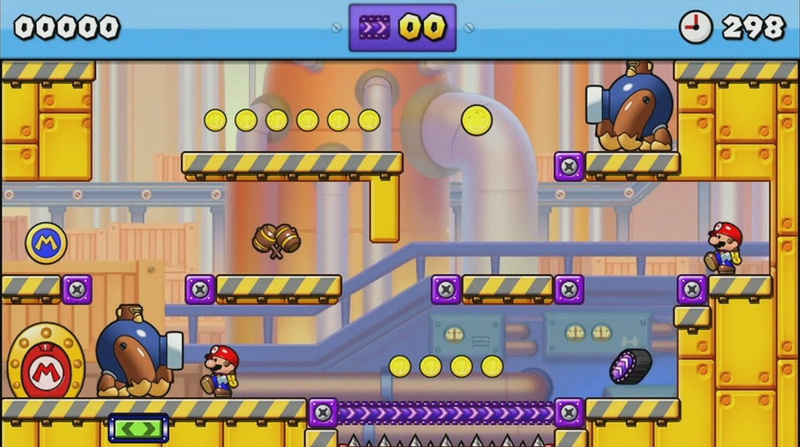 Mario vs. Donkey Kong: Tipping Stars (Nintendo, $19.99 or free if you purchase the Wii U version and redeem the code provided) - As per the Wii U entry but on the go, in its most basic terms, though it does utilise StreetPass for level sharing; you can see our in progress review of the 3DS version here. OlliOlli (Curve Digital, $8.49 or free if you've already bought the 3DS version on the same Nintendo Network ID) - The same game on the go, this does have a slightly more zoomed out perspective, yet otherwise has all of the same dual screen and online features. We'll bring you a review soon, and also covered this portable entry in the preview linked above. Proun+ (Engine Software, $5.99) - Originally on smart devices, this has a simple momentum-based concept in which you guide a ball along tricky on-rails courses, trying to avoid obstacles as your speed increases. It's a simple concept infused with stylish visuals and an excellent soundtrack - we'll bring you a review soon, but we certainly enjoyed our time with this in our Proun+ preview. Zombie Incident (Coderchild, $1.99) - We now know that this is a retro-styled platformer that can run on the 8-bit MSX system, and our review is shuffling along. In the meantime, here's the plot: "Hamartia, the great citadel, became the symbol of human sin. After centuries of excesses its penance was going to come. In the darkness of the night, chaos invaded everything. Beasts started to scream. Nothing was like before! No one sane would go to that place." Crikey. 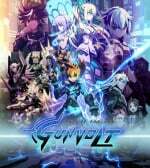 Azure Striker Gunvolt (Inti Creates, $14.99) - This is listed again by Nintendo due to a significant update that's gone live. Save data from the demo can be transferred, there's better performance and use of ZL and ZR to change weapons on the New Nintendo 3DS XL, and there's a new Boss Rush mission. We were big fans of this in our Azure Stiker Gunvolt review. That's your lot, North America. Let us know what you'll be downloading in the comments and poll below. I'm getting Mario VS Donkey Kong first but that Zombie Game looks interesting as well. Gonna get all Kirby themes. If I had more money I'd definitely get MvDK:TS. Getting the home themes once I get my New 3DS. Also there is a mistake on the OlliOlli under the 3DS eShop heading, it should say free if you buy the Wii U version, not the 3DS version. Mario vs. Donkey Kong: Tipping Stars for me. Wasn't aware of the Gunvolt update! That'll be a nice update and definitely tipping stars. I'm really waiting for a Bravely Default discount too one of these weeks. Just to clarify though, if I already have Azure Striker Gunvolt, I can just run the game and it will automatically update, yes? Mario vs Donkey Kong. Maybe OlliOlli as well. Now if only those VC games were crossbuy. That might be coming sooner than later so the only VC games I am getting now are ones that were not on the Wii already. OlliOlli 3ds+ wiiu and Tengami. I already got Witch and Hero, 4 days ago. I love it. nothing for me this week, and my wallet thanks me! Getting Olli Olli, still not sold on MvDK. And I will try the demo for Gunvolt. I'll get OlliOlli on my Wii U, but probably not this week - way too uch going on right now. I'm playing through the DKC SNES trilogy, still have to finish Watch Dogs and Captain Toad, and Majora's Mask is coming in the mail this week. seems like Nintendo doubled the price of MvsD to compensate for the crossbuy promotion. Does anyone know when Starwhal and the new Zen Pinball tables are coming for Wii U? I might just pick up Tengami while it's on sale! Love the soundtrack! $20 for Tipping Stars? That's a hefty price tag for a game like this. Wasn't the previous game only $10? Not buying Mario vs DK. They keep putting out the same game over and over and over with that series, imo, and now they're wanting to double the price for it? No. @manu0 Yep - Nintendo's version of crossbuy is pay for both. tipping stars.. is there an official way to trade friend codes? btw its 9:43pm here and its still says "coming soon" in the eshop.. when will it be for sale? I believe it is an hour and 10 minutes from now.... or 2 hours and 10 minutes... can't remember which time it is... it is either 1:00PM Atlantic time or 2:00pm. lol I never get home/check it soon enough to know which one. Nintendo you let me down again this week cause BLAAAAH blahblahblahblah blah. Blah blah blahblah. Blah? Blah blah. Blaaaaaaah. Now a bunch of people don't have to post cause I got it covered. Tengami is half off? Well, I think now's a perfect time to get it! No Hyrule Warriors DLC. I'm sad. Not much this week....I'll try the Gunvolt demo. I'll be getting Mario VS DK on Wii U (then free on 3DS I suppose), look into some of the discounts, maaaaaaaybe some new Wii U/ 3DS games and a Kirby theme. Not getting these games, as I am working on the games I already have, and older games I haven't gotten yet. Just wanted to throw out how good Master Reboot is. My only caveat is that the game plays in first-person, with some platforming parts to it, and those give me motion sickness really easily. I had to read your post about 3 times until I understood what you meant. Your wording was very confusing. Perhaps you missed that 3 DK VC games came last week on 3DS. I think they're allowed to take a week off. I always think its a bit silly when people complain that a single niche game hasn't come to VC, in your case, Kirby Tilt n Tumble. I voted for OlliOlli on WiiU, but since I have a 3DS too, I'll be getting them both. I highly recommend this game to everyone. I've got the Vita version, and I liked it so much that I'm double-dipping on WiiU/3DS. And OlliOlli2 just came out on the Playstation platforms. I'll also be getting Mario v. DK: Tipping Stars, Zombie Incident, and with the discount, Aeternoblade looks attractive. This seems interesting for a group of gmes but hopefully they can get more virtual console games up next week. @vonseux I know. I had 200 coins to redeem the DSiware one. Didn't have enough coins for the other one. So I just bought it. Will buy the new one when I get paid next week. @AmyGrrl - "to promote the new release." Nintnedo's idea of promotion is to do absolutely nothing and just expect the game to sell itself b/c they made it. When's the last time you saw so little press for a $20 download only game? And they have 2 systems to promote this one on. I was sure I was getting Mario vs DK but that price.... come on Nintendo, this is not how you do cross buy... oh well. Havent had much in the first party realm lately so I still may get it.. Does anyone know if I buy OlliOlli now for my 3ds if I also would get the license for the WiiU. Or did that deal expire? Definitely gettin Mario vs Donkey Kong. I highly recommend Azure Striker demo (and full game) to everyone. So much fun. Nothing for me this week. That price for Mario vs DK killed it for me. Another lame week for the eshop, but what can you expect from Nintendo with there over priced cross buys. Nothing for me this week. About time the Kirby themes are here. I'll be jumping on that Tengami discount, not much of a Mario vs. DK player. I've been playing OlliOlli and OlliOlli 2 on Vita, I highly recommend it if you're a fan of score-heavy games and skateboarding. Is it odd that I get more excited for the new 3ds themes released every week? $20 for Tipping Stars? It's like they wanted to experiment with cross-buy but some grumpy exec didn't want them to lose money, so they doubled the price of the game to make up for it. Tempted to pick up Tengami for that price, but I've already got more games to play than I can count. I dunno about you guys, but this game is pretty sweet. I'll definitely pay $1 to upgrade it to the Wii U menu. Hells yes! Word of warning: DO NOT BUY MASTER REBOOT! I bought it for $5 &I still feel like I payed too much. I'm probably going to get one of the Kirby themes, maybe the Gunvolt one, but I already went ahead and got the new Theatrhythm DLC songs that were released today but omitted from the above lost somehow. Weren't previous Mario vs. Donkey Kong games $35 - $40? I'm confused why so many people are saying $20 is double the price. Is it because there's a 2 in it? Math is hard. I am seriously wondering where this allegedly agreed upon value of $10 is coming from. I might hope for a $15 copy of this if there was no cross-buy, but $10 seems awfully low for a Nintendo published eShop game. I wonder how fast those codes will show up on ebay. @3Daniel: I was thinking the same thing. I'd rather pay half and have it on my 3DS only. I'll wait for a discount. @aaronsullivan: Because DK Minis on the Move was $10. Been looking forward to playing Olli Olli on my 3DS. Bonus I can also play on Wii U. There is a serious lack of skateboarding games nowadays and I hear this one is actually pretty good. Come on indie devs, let's get a T&C Surf Design remake going!!! Nothing for me this week. I'll keep trudging through the backlog. @3Daniel: As do I, but I barely play my Wii-U. If we were talking about the same game that argument would hold some weight...but we aren't, so it doesn't. I'm leaning towards OlliOlli, but for those that have played it... how is it? I'm always on the fence about skateboarding titles. I saw a preview for it this morning and it looks cool, but I'm curious about what players think of it. And if not OlliOlli, probably Tengami since I hear lots of good about it. The 3DS home themes are a nice touch, but if you've already purchased the game (such as Azure Striker), the theme should be a free download. Well, that's confusing. MvsDK gave a code for Wii U version but OlliOlli just comes up 'free' in the Wii U shop. Nice to see someone else enjoying Witch & Hero. That review from nintendo life was criminal. People need to stop compalingjng and buy Olli Olli. @GuitarAnthony Nintendo gives a code for some reason. I think they do that so that people can give it to someone else if they want to. Yet they could have easily just had a "gift" button for that purpose. You know, a feature that the Wii Shop Channel had, and is probably one of the only ways that it is actually ahead of the eShop. Neither eShop has a standard that was on their last gen system. @pardonme I think that most people hates that game because it is "repetitive". I think that it is fun and challenging, of course there is going to be some repetition because of the theme. But I like it, I think that Witch & Hero is a good game to people who like "survival games". I do. Just to be contrary, not trying to play a side here but we are talking DSiware and a 3DS download. Those are different generations, development processes, etc. I won't claim to be in the know about anything there but it's not really comparable, is it? my wording is never correct and I know abut last week I thought they would continue the movement like there are more coming soon I guess we have to wait for Capcom and Konami and Natsume to make some more so they can have a break I was hoping for donkey kong country gbc version too. @sweetiepiejonus it is when you are talking about what the extent of new features are for this title that justify it costing more than twice as much as the previous dsi version. Minis march again had level creation and sharing and the gameplay seemed roughly the same. It wouldn't be fair to compare 10 Second Run on the dsi to Tipping Stars but it is absolutely legitimate to compare Tipping Stars to a previous entry in its own franchise. Especially one that it seems to borrow quite a lot in terms of execution and ideas from. Got OlliOlli 2 for free on PSN. Nothing good for this week. Fingers crossed that next week will be good. Yes, Witch and Hero is greatly underrated. I think it doesn't help that the manual leaves out a few things. But I love that little game! So original!!! wow, Tengami is amazing!! Please, play it I really liked it. It's beautiful and intelligent. Guess I'll download the Azure Striker demo since I still haven't bought it. Will wait for the review before I decide if Mario v. DK is worth $20. @sweetiepiejonus: The hell it doesn't! They should have just made it $9.99 on either system and be done with it. @andrew20: I agree. I thought a while back we were supposed to get Mega Man for the Game Gear? I wish they'd make a Mario vs. Donkey Kong that plays like the first one and the Game Boy Donkey Kong. That's so much more fun than the stuff with the Minis is. Tipping Stars is a hoot. I split the cost with a friend and gave them the 3DS code. Would love to see the Wii games make a return. Kinda weird how N64 and Gamecube just got skipped right over... and that we're still waiting for the NA debut of DS titles on the VC... even though we don't care about those. OlliOlli and Mario vs DK for me.